"In July 1553, sibling rivalry looms perilous, even life-threatening, between the daughters of King Henry VIII. Their brother King Edward is dead, his successor Lady Jane Grey has been beheaded, and Queen Mary Tudor has just won possession of the throne. But her younger half sister—the beautiful and vivacious Princess Elizabeth—holds the hearts of the people. Despite Mary’s health fading fast and her power beginning to crumble, she won’t give up the throne, determined to rule to the absolute end as her father did before her. In these treacherous times, when all about her there is secrecy and deception, Elizabeth must rely on her faith and courage if she is to survive her ordeal and rise to fulfill her destiny. With grace and elegance, Margaret Irwin continues the story begun in Young Bess, giving readers an intimate peek into the world of that most enigmatic of Britain’s monarchs." Elizabeth I is widely known as the greatest monarch England has ever had, but though her reign was that of a golden age, her rise to power was not with out turmoil. In Elizabeth, Captive Princess we follow the story of Mary Tudor's early years as sovereign; beginning with Lady Jane Grey's short and fateful reign and continuing until the arrival of Prince Phillip of Spain. Told from the joint perspective of Elizabeth and Mary, a battle of wits and cunning tactics ensues, capturing the readers attention with political intrigue page after page. Having not read the first book in this trilogy, (Young Bess) I was curious how well I would pick up the plot line for this novel... I am happy to say I had no trouble at all. 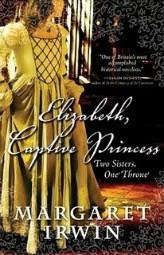 Elizabeth, Captive Princess grabbed my attention from the start. The conflict between Elizabeth and Mary was so vivid, almost as if you were in the same room watching their story unfurl. While the moments of intense drama between these two sisters was superb, I found the times when the focus switched to the leaders of rebellions to be lacking. Of course it was necessary to include the plotting of such rebellions, but it seemed to be missing suspense and I found myself wanting to hurry through those chapters. The last quarter of this book set the stage perfectly for the next and final installment of the trilogy, Elizabeth and the Prince of Spain. Overall this was a good read, and while it did not have a wow factor, it definitely held its own in a most captivating way.